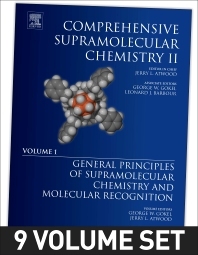 Comprehensive Supramolecular Chemistry II, Second Edition is a ‘one-stop shop’ that covers supramolecular chemistry, a field that originated from the work of researchers in organic, inorganic and physical chemistry, with some biological influence. The original edition was structured to reflect, in part, the origin of the field. However, in the past two decades, the field has changed a great deal as reflected in this new work that covers the general principles of supramolecular chemistry and molecular recognition, experimental and computational methods in supramolecular chemistry, supramolecular receptors, dynamic supramolecular chemistry, supramolecular engineering, crystallographic (engineered) assemblies, sensors, imaging agents, devices and the latest in nanotechnology. Each section begins with an introduction by an expert in the field, who offers an initial perspective on the development of the field. Each article begins with outlining basic concepts before moving on to more advanced material. Prof. Jerry L. Atwood received a B.S. in chemistry and mathematics in 1964 from Southwest Missouri State University. After receiving a Ph.D. from the University of Illinois in 1968, he accepted a position as Assistant Professor at the University of Alabama, where he rose to the position of University Research Professor in 1987. He moved to the University of Missouri-Columbia in 1994, where he is currently a Curators' Professor and Chair of the Department of Chemistry. His discovery of liquid clathrates in 1969 provided the underpinnings of the current ionic liquid research, ultimately leading to his involvement in the emerging field of supramolecular chemistry. Prof. Atwood first discovered organic clays, O-H...hydrogen bonding involving water, ordered water clusters, including (H2O)10, in a supramolecular environment, and selective binding of anions within the cavities of metallated calixarenes and related hosts. In 1997, Prof. Atwood published the discovery of a chiral spherical molecular capsule held together by 60 hydrogen bonds. This work led to a strategy for the design of very large molecular capsules based on the geometrical principles of Plato and Archimedes. In 2000 he was awarded the Izatt-Christensen Prize in Supramolecular Chemistry. Beginning in 2002, Prof. Atwood published several studies in which a new view of porosity and the organic solid state is delineated. Recent discoveries have revealed robust nano-capsules based on pyrogallolarenes seamed together by metal ions, and the use of gas pressure to control the crystal form of pharmaceutical compounds. Prof. Atwood has published over 680 research publications, which have been cited over 29,000 times. He has served as editor of numerous peer-reviewed journals, including a ten-year term as Associate Editor for Supramolecular Chemistry for Chemical Communications. George Gokel earned the B.S. in Chemistry at Tulane University and the Ph.D. at the University of Southern California working with Ivar Ugi. After a post-doctoral fellowship with Donald Cram at UCLA, he worked briefly at Dupont Central Research and then assumed a position as Assistant Professor at the Pennsylvania State University. He has held professorships at the Universities of Maryland and Miami (Florida) before moving to the Washington University School of Medicine to head the Program in Bioorganic Chemistry. He is currently Distinguished Professor of Science at the University of Missouri-St. Louis and Director of the Center for Nanoscience. He is recipient of the American Chemical Society’s Midwest Award, the Izatt Christensen Award, and he is a Fellow of the St. Louis Academy of Science, the American Association for the Advancement of Science, and the National Academy of Inventors. Len Barbour completed his PhD in solid-state supramolecular chemistry under the guidance of Luigi Nassimbeni at the University of Cape Town. He then undertook a postdoctoral fellowship with Jerry Atwood at the University of Missouri – Columbia, where he continued to develop his interests in solid-state inclusion chemistry. In 2003 he was appointed as an Associate Professor at the University of Stellenbosch and in 2005 he was promoted to Professor. Two years later he was awarded a South African Research Chair in Nanostructured Functional Materials (2007-2021). He is currently a Distinguished Professor of Chemistry at Stellenbosch University and an Associate Editor of the New Journal of Chemistry. Len Barbour’s research interests include the development and characterization of new porous materials and the study of anomalous thermal expansion. He has published over 180 research articles and several book chapters.